Not to be confused with Robot Lincoln. 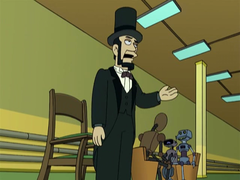 Linctron is a robotic version of Abraham Lincoln and while he does think he is Lincoln as intended, he suffers from split personalities; all of them Lincoln. As a result of this mental illness, he was assigned to the HAL Institute. He states that he was born in 200 log cabins. This may mean he has 200 alternate personalities (still all Lincoln). Linctron is modeled off of the Audio-Animatronic Abe Lincoln at Disneyland's Great Moments with Mr. Lincoln show. Linctron: I was born in 200 log cabins. This page was last edited on 5 September 2014, at 01:07.